Renault highlights, in a new ad, that, with Renault SELECTION, “second hand cars always provide first class emotions”. 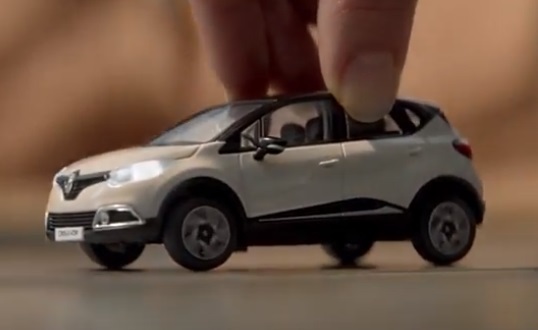 The 60-second spot, titled “The Selection,” features a pre-teenage girl playing with several tiny Renault cars in her room, enjoying every single moment she spends racing with her special toys, until she has to leave. The ad goes on with the girl’s dad two years later taking one of the cars left under the bed and giving it to his other daughter, who’s now 6-7-years old and seems very delighted by her new toy. The soundtrack music is the 2012 single “Joey Lawrence of Arabia” by Heavy Young Heathens, consisting of brothers Aron and Robert Mardo, who are known for their work composing and performing music for films, film trailers and TV series. Launched in 2015, Renault SELECTION, the pre-owned car brand of Renault, is now expanding in major markets. According to the automaker, each vehicle in this program complies with Renault quality standards, which imply being less than 6 years old and under 120,000 km. Moreover, each vehicle is subject to a full history check, a multi-point mechanical check as well as a full service and valet before a customer can drive it out the door on the day of purchase, with the “Buy Today – Drive Today” option. Every Renault SELECTION car includes 2 years roadside assistance and one of the most comprehensive warranties of an industry leading minimum of 2 years or 200,000 km.